I’m so distracted that I actually went to the grocery store, bought food for tonight’s dinner, and left the bags in the cart. Had to return to pick up the groceries. I’m going to take off a few weeks and concentrate on family events because at the end of the day, family is what is most important. I’ll return shortly and hope you’ll be here, reading my posts, laughing and thinking with me, trying to get the writing right. In the meantime, I send all good blessings your way and hope they come round again to greet the new baby. Draw back the curtain, dusty and threadbare, to my childhood, and you’ll see a kid propped with a book as often as anything else. We had the first color TV in our neighborhood, a modern wonder that everyone came to watch, me gloating over the regal status of our family. An in-ground swimming pool in our backyard cooled us each afternoon while everyone else traipsed to community pools to escape New Jersey’s blistering summers. I threatened all my limbs racing a bike over the uneven landscape of sidewalk slates erupted by the roots of saplings planted 50 years earlier, now grown to jungle size. My childhood also included an excess of torment, from events I won’t describe or attribute. At night when my jelly jar beamed with lightning bugs signaling for release, when the attic creaked its rotted beams and Jack Parr entertained adult viewers with his suave, nasal humor on late night TV, I lay in bed with a book and entered worlds more fierce and tragic, heroic and dangerous, romantic and exotic than my own. The Witch of Blackbird Pond, Johnny Tremain, The Adventures of Tom Sawyer, Little Women, Black Beauty, The Borrowers, Heidi, Adventures of Huckleberry Finn, The Twenty One Balloons, A Little Princess, The Swiss Family Robinson, Hans Brinker or the Silver Skates, The Secret Garden, Pollyanna, The Railway Children – all these and more captivated me and kept me up hours past bedtime. They gave me insight to the difficult lives of others. They gave me courage, come morning, to tackle another day. One book was so special I’ve already bought a copy for my young grandson, years before he can read it. 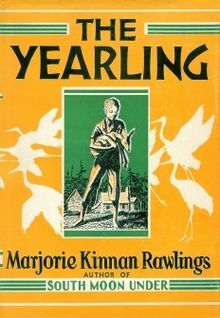 The Yearling, by Marjorie Kinnan Rawlings, is about Jody, a youngster who lives in the Florida back country with his parents and his adopted orphaned fawn. Life is harsh and hard scrabble, every grain of corn a hedge between mere hunger and flat out starvation, every encounter with nature a potential threat to existence, every neighbor an adversary with their own desperate circumstances to overcome. Jody adores his indulgent pa, his remote ma, his sensitive, crippled friend, and the fawn, Flag. Flag grows up to become a healthy, ravenous buck and a threat to the family’s tenuous grasp on sufficient sustenance for the following year, forcing Jody to make an unthinkable decision. It gripped me like no other book. It was first of all much longer than anything I’d read by at least 100 pages. Rawlings believed I could read a book this long, that I had the stamina to maintain attention for a sustained period. She trusted that I had the intelligence to keep tabs on a large cast of characters, some despicable, some so ingratiating that I still love them, all of them original and unforgettable. She engaged me with a complex plot and a sense of language so identifiable that I learned to speak 19th century Floridian with the best of the swamp dwellers. More than that, Rawlings threw me a life raft. All the stories I’d read and loved told tales of people, usually children, surviving unlikely odds, but The Yearling treated me like an adult. (In fact, she wrote a book. It has come to be considered a young adult book.) Her dollar words and profound ideas made me think about the issues that motivate people to endure the impossible. The story gave me insight into how to navigate the unpredictable and sometimes violent swamp of my childhood. It showed me a way to identify the currents beneath my own strange family issues and swim to the surface. I couldn’t understand Jody’s ma, and I couldn’t understand my own mother. And the book made me try to write like Rawlings. What did a New Jersey kid know about the wilds of the Louisiana or Florida swamps, the vastness of the American prairie, or even the poverty of the downtown Black neighborhoods? Not much. Didn’t stop me from writing about them. My stories became populated with folks who had Southern drawls or Western twangs and lived in foul places built more of imagination than any reference to real locales. What did an 11-year-old know about restrictive social impositions on the other side of town that made it impossible for a man to care for his family or for a woman to walk proudly? Hardly a thing. Didn’t stop me from creating them. My characters faced unjust tribulations and resolved them with courage and invention even if the events were outrageous and the outcomes impossible. I didn’t even flinch from occasionally letting a protagonist die. Melodrama was my forte. My teachers encouraged me, if only because I used lots of adverbs and adjectives and fashioned strange names for my characters. I won a few school awards and fleeting acknowledgement. My parents applauded my effort, though I’m pretty sure they never read anything I wrote. No matter. In the far dark corner sat a little woman with a stern face who waited patiently while I put down my stories in longhand. My hero, Marjorie Kinnan Rawlings, prodded me to write. Decades ago and long interrupted but now restarted, I began to write stories. I wrote first for children; now I write for adults. My stories are about people who confront savage or mysterious circumstances and overcome personal failure to find a way to triumph. It’s what happened to Jody. I try to engage readers as much as Rawlings engaged me. I hope that people find solace in my stories for what can’t be described or attributed in their lives. What childhood book stays with you? 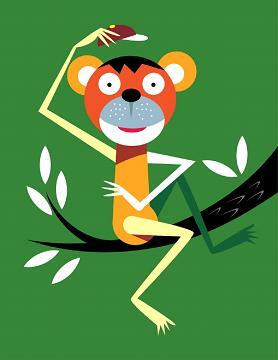 Leaping Lizards, It’s the Liebster!